By Lori Ferraro When I think of Valentine Day in the 80s my memories go to the following boyfriends/gifts: In eighth grade I bought my boyfriend, Albert, a big gold medallion that said “Libra” and had the tipping scales on it – he was my first real boyfriend and I was super excited to give him this fancy piece of jewelry in a little black velvet box. 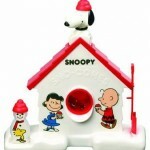 In the tenth grade my boyfriend Lenny gave me one of those novelty coffee mugs with a miniature teddy bear inside it – the mug said “I LOVE YOU BEARY MUCH.” My junior year my boyfriend Jason came over to my house for a romantic dinner that I took credit for making, which my mother actually made. Jason gave me some a big stinky bottle of Fendi perfume and this gigantic I LOVE YOU balloon that popped seconds after this photo was taken: Don’t give love a bad name! Valentine’s Day is upon us – the 80s fan in your life can truly become your endless love by surprising them with one of these totally awesome gifts. For me it will be hard to top that miniature bear in a mug but hey…you can try. Looking to up your high score in the gift department? 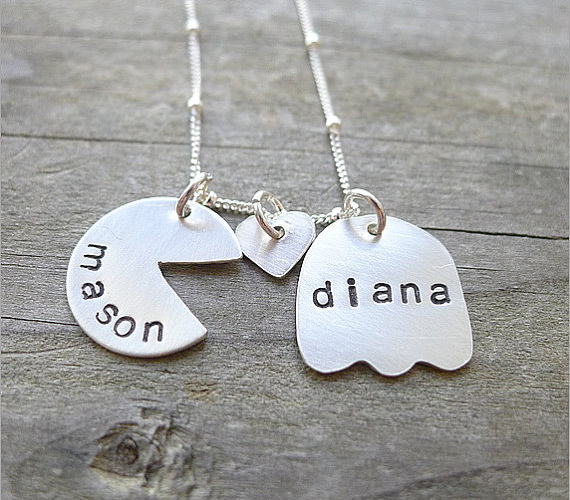 How about this handmade sterling silver personalized Pac Man and ghost necklace that includes three sterling silver charms – a Pac Man a tiny heart “pellet” and a Ghost with names of your choice. Make her heart go wakka-wakka on February 14th with this unique one-of-a-kind necklace. 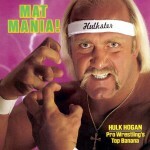 Not your typical 80s love songs CD . 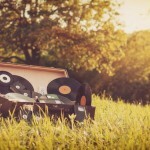 . . you won’t find any “Time of My Life” or “Hello” here. This CD is filled with more new wave love songs such as “Suddenly Last Summer” by The Motels, “I Got You” by Split Enz and “Space Age Love Song” by A Flock of Seagulls. Ooooh, and who doesn’t want to have a romantic dinner at home while listening to “Love Plus One” by Haircut One Hundred? I DO. Show your love your love with this retro t-shirt! 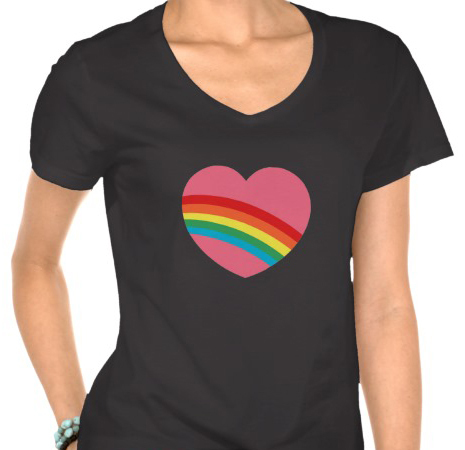 Because what says 80s better than a pink heart with a rainbow going through it? NOTHING! The only thing missing is a unicorn and a Pegasus flying through the air. I just called to say I love you! 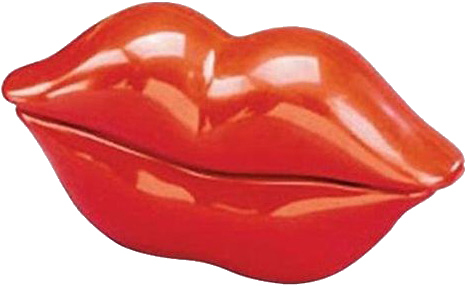 Pucker up with this 80s-inspired lips telephone. So popular back in the day, I had a friend who had one and I loved going over to her house after school to hang with her, admire her phone and call to boys on it. 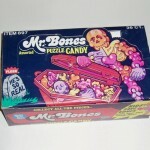 I had another friend with a cheeseburger phone which was also cool, but this one was my favorite. 80s Inspired Valentine’s from Meow Kapow! 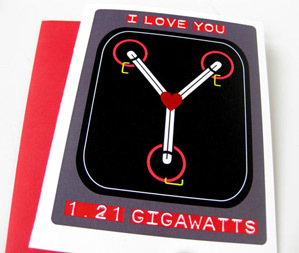 What’s more romantic than a Back to the Future Flux Capacitor valentine? 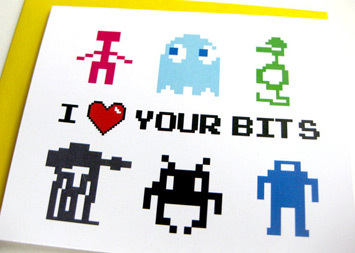 And how cute is the “I love your bits” that references Pac Man, Space Invaders and Berserk? I would put these puppies in frames if someone gave them to me. The shop also has a fantastic Skeletor Collage art print and a little spiral notebook made from an old school library card. Awesome. 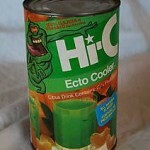 Take your valentine back to the 80s this year with one of these great gifts. If you want to make the night extra special/authentic be sure to pile on the Polo cologne or Obsession perfume, exchange a single red carnation and slow dance to “Lady in Red” by Chris DeBurgh. Happy Valentine’s Day.